The NCC collates generic reports from the regular supply of production and sales/dispatch data it receives from its member manufacturers. The products represented are tourers, motorhomes, caravan holiday homes (these three product types are leisure accommodation vehicles) and residential park homes (for housing use). This information is distilled into monthly reports which members use for benchmarking purposes. Individual company data is held confidentially and not shared. Market share information is not available from the NCC. The UK market is also supplied from non-member sources, in some cases from Continental Europe. Individuals may also make private purchases from overseas. The proportion of total UK sales related to this varies from sector to sector. In the annual data the NCC publishes here, allowances are included for such non-member activity. In addition, there are approximately 100,000 residential park homes in use for housing. 98% of all new tourers sold in the UK are manufactured by NCC members – the remainder will have been imported from mainland Europe by dealers or individuals. Data is based on returns from NCC member manufacturers for tourers built to comply with BS EN 1645 which can legally be towed by a motor vehicle whose maximum gross vehicle weight is no more than 3,500 kgs. The data further includes an estimate for non members (covering imports, 5th wheelers, folding caravans/trailer tents etc). It excludes products such as showman’s or oversized caravans which are required by law to be towed by vehicles whose maximum gross vehicle weight is greater than 3,500 kgs. 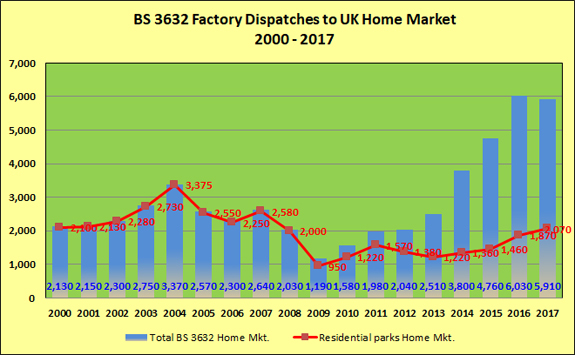 Data is based on returns from NCC member manufacturers for dispatches from factories to park operators and private individuals built to comply with BS 3632 - residential specification homes for housing. In addition, these products may also be used for holiday accommodation on holiday parks (but not for residential purposes). Products range from the traditional stucco coated park home (or "mobile home") to include lodge style homes (timber clad appearance). The blue bars show the total dispatches to both holiday parks and residential parks. The red line indicates factory dispatches only to residential parks. The UK is the only market for a residential product of this nature throughout Europe, so exports are insignificant. Data is from factory dispatches by NCC member manufacturers destined for the UK Holiday Park sector. The product is a caravan built to comply with British and European Standard EN 1647 or British Standard BS 3632, i.e. for use as leisure accommodation, not for full time residential occupation. Exports have declined steadily since the early 2000’s. Imports are negligible. Data is sourced from the registrations of new motorhomes recorded by the DVLA from V55/1 first registration forms, automatic first registration and Licensing (AFRL) and V55/2 and V55/4 forms. Prior to 2004, it is believed that there may have been some mis-classification of imports by the authorities. 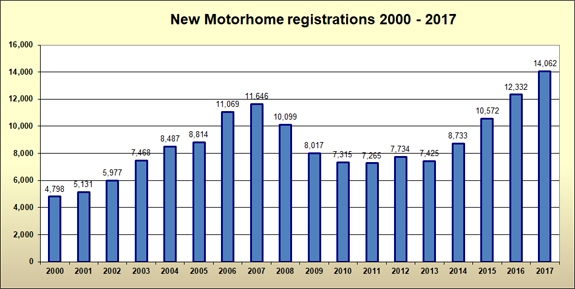 This could have resulted in an understatement of total registrations for the years 2000 to 2004. 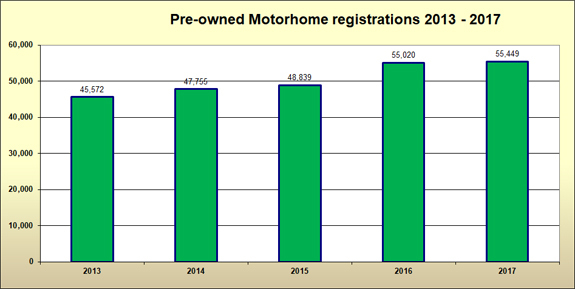 The UK motorhome market experienced annual growth rates every year until 2008 after which economic difficulties in the UK have impacted upon sales of new product. European motorhome registrations have declined from the high of 2008, in line with setbacks in economies, with the German market - the second largest in Europe after France - being the most resilient.